Perhaps your queries are already long, or may be even longer. Wouldn’t it be nice to shorten the number of steps? It would make it easier to read. In this tutorial we are going to talk through how we can combine several steps when you create a new column. This is achieved by modifying the M scripts or equations slightly when new columns are created. While doing this won’t cut down every query in half, but it will remove a couple of additional steps per query. This makes your queries easier to read and maintain. Also, using this best practice, will save you headaches in the future. At some point you will run into a data type error. 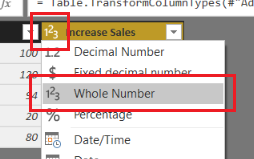 This is seen when you try to join multiple tables on columns with different data types, or when you need a measure to create a SUM but the column data type is still text. 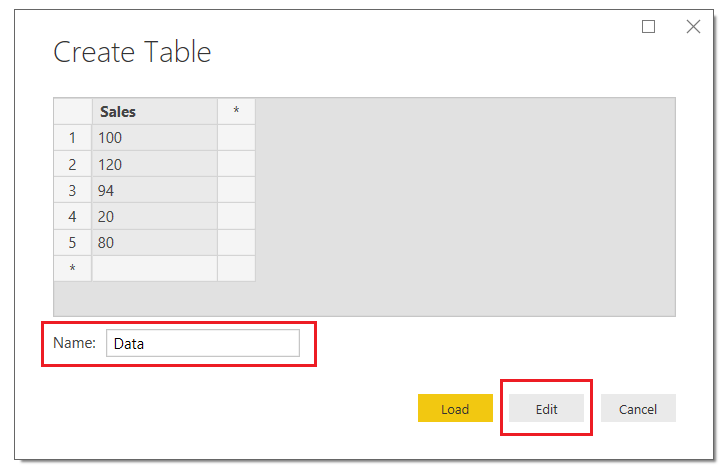 Once you’ve entered your data the Create Table screen should look like the following. Be sure to name your table, in this case I named my data table Data…. yea, feeling a lack of creativity today. 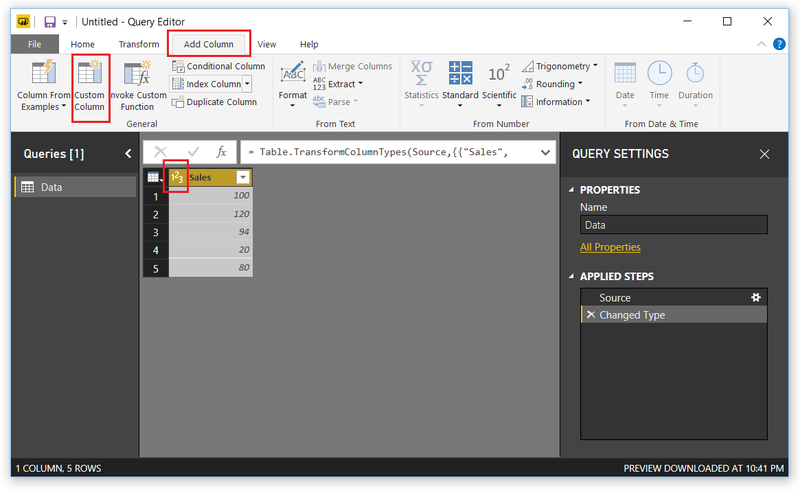 Next, click Edit to modify the query before loading the data into Power BI. This will open the query editor. Click on the Add Column ribbon, then select Custom Column. The Custom Column dialog box will open. 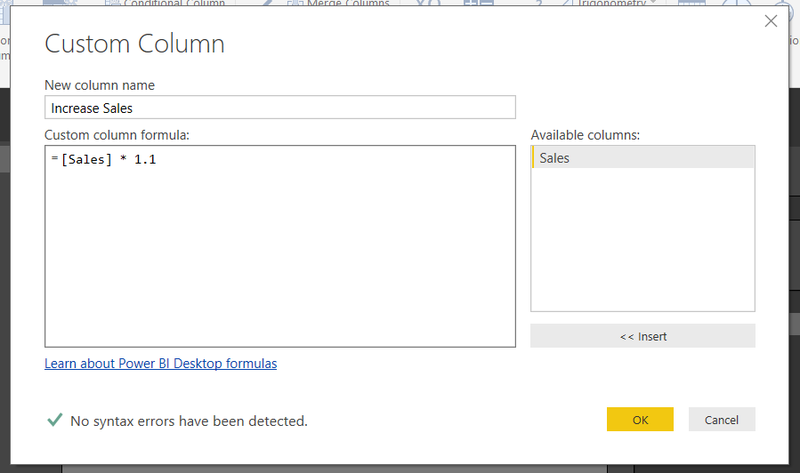 Note: When you bring in the created table that the Sales column already has the data transformed into a whole number. Also note in the right under Applied steps we have two steps, one for the source and one for Changed Type. This is because not every M equation (M language is the language used to perform the ETL in the query editor) can handle data types. In the Custom Column dialog box enter the following, the column name, the equation below. Click OK to add the column. Great, now we have our new column. Notice the image in front of our column named Increase Sales. 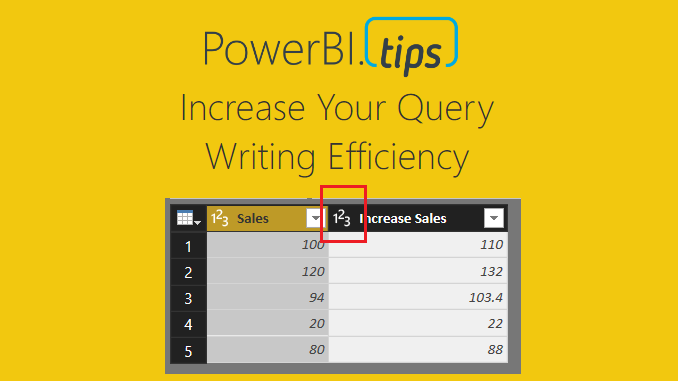 This means Power BI thinks that the data type of this column could be Text or a Number. Let’s change it. Click on the ABC123 icon and select Whole Number. 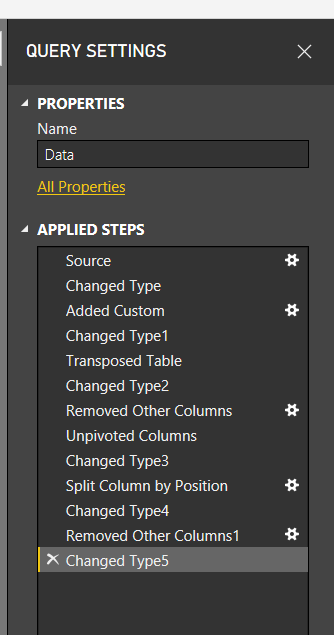 Now the column data type has changed to numbers only. If we glance at the Query Setting under the Applied Steps, we now have 4 steps. Two were added, one for the added column and the second for the data type of the column. This is not what we want. Instead we would like the column to be added with the appropriate data type right from the beginning. Let’s remove the very last step labeled Changed Type1. To do this we will click on the little X next to the step. This will remove the step. While highlighting the Added Custom step click in the formula bar and modify the equation to include the following statement in RED. Press the Enter to execute the new formula. Note: if you don’t see the formula bar it can be toggled on or off in the View ribbon in the check box titled Formula Bar. I don’t believe the syntax changed, this is just an alternative way of designating the different data types. When you use M and manually change a column’s data type you might get a different syntax. For this article, I found this syntax to be clear and consistent between the various data types I was working with. Hope that clarifies things. Int64.Type does not support 103.4. This generates an error when closing and applying. The division you are applying is causing a decimal number to be created. Then you are forcing the column to become an Integer. Instead try wrapping your division statement in the following M Function Number.Round( 69/5000 , 0 ) Then call off the column data type as Int64.Type. This way you are forcing the mathematical operation to be a whole number before you declare the Data Type. Doing this removes the error when loading data into the data model. Thanks for summarising this, found this much easier to digest than other results I found in my search. Great explanation! However the disadvantage is that when you want to recreate the query in another file, you have to remember the data type for each column. You lose the visibility created by the additional “Changed Type” query step. Excellent point. It is a downside. In most of my queries I am very familiar with my data. Thus, this technique might be more of a personal preference.